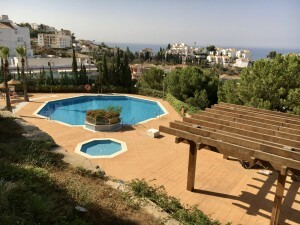 Valtocado is an urbanization in Mijas which is popular for its spectacular sea and mountain views and its quiet location close to the coast and all amenities. The villa we offer for sale in Valtocado consists of 2 floors. On the main floor you will find a guest toilet, office, kitchen with separate laundry room, spacious living room and a unique round dining room with windows offering beautiful views to all sides. Both the kitchen and the living room have direct access to a large terrace. Downstairs you will find 3 bedrooms and 2 bathrooms (one is ensuite). This floor offers direct access to the swimming pool area which can also be reached from the main floor via a staircase on the outside of the house. 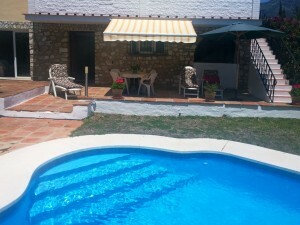 The villa is situated at the end of a cul-de-sac and offers central heating, a carport for 2 cars and panoramic views ? on a clear day even all the way to Africa. Mijas Pueblo is a 5 minute drive, the beach can be reached within 10 minutes and Marbella, Malaga and the airport are all just a 30 minute drive away.